Don’t confuse a Cesspit with a Septic Tank or Cesspool. A Cesspit is an underground chamber used for the storage of sewage. The appearance of a cesspit is similar to that of a ‘hand dug’ water well. Cesspit’s were traditionally constructed by digging a cylindrical void into the ground of approximately one metre in diameter, and typically to a depth possible without machinery. The void would be lined with bricks, positioned approximately 2” apart, thus keeping small voids between the bricks. A concrete slab would be positioned on top of the bricks with a manhole access point. The idea of a cesspit was to allow liquid sewage to soak into the ground through the soil base of the cesspit, and gaps between the bricks. 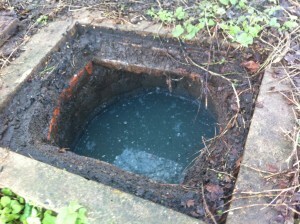 The remaining sewage solids would settle and compost in the base of cesspit. This would have the effect of ‘blinding’ the base of the cesspit, preventing any of the liquids from soaking away. The use of cesspit’s has not been permissible for some time, due to the significant pollution risks. The Public Health Act of 1936 prohibits their use, but this represents a consolidation of a number of previous Acts. Records show that a Government committee in 1875 stated that this style of cesspit be ‘utterly condemned’ (ref. Sewage Disposal Works, published 1890). Cesspit’s should not be confused with Septic Tanks or Cesspools. Septic tanks are designed to separate the solids materials from the liquids, with the liquids discharging out of the tank and into an underground soakaway / drainage field. Cesspools are sealed, watertight underground tanks designed to simply collect sewage without processing, treating or allowing the sewage to soakaway. Septic tanks typically have two chambers and within these chambers Anaerobic digestion takes place, whereby anaerobic micro-organisms develop and partially degrade the receiving waste water. Within the septic tank solids settle to the floor of the chambers and materials such as tissue float to the top of the liquids and form a scum layer. Within traditionally built tanks there are normally ‘T’ pipes located on the inlet and outlet. The purpose of ‘T’ pipes is to prevent floating material and settled solids from passing through the septic tank and into the soakaway network. Modern septic tanks which are manufactured from Fibreglass or Polyethylene normally have internal baffles to prevent floating and settled materials from passing into the soakaway. Septic tank soakaways / drainage fields typically consist of a system of sub-surface irrigation pipes which allow the effluent to percolate into the sub-strata. They may be used where the sub-strata is sufficiently permeable and in locations which are not prone to flooding or water logging at any time of the year. A Cesspool is merely a holding tank designed for the containment of sewage. Cesspools are typically constructed from fibreglass and are designed to be installed underground. A cesspool has one inlet for the connection of foul drainage and one socket for the connection of a vent. A cesspool doesn’t have an outlet. Therefore, if a soakaway / drainage field is present then an alternative form of sewage tank is installed, most likely a septic tank. Cesspools should not be confused with septic tanks. Septic tanks provide partial treatment of sewage and have an outlet which connects to an underground soakaway / drainage field. Click here for further information on septic tanks. A Cesspool would require frequent emptying by a Licensed Waste Carrier, and as a result, can cost the owner of the cesspool thousands of pounds per year in emptying charges. A cesspool should only be installed in situations where an alternative waste water disposal method cannot be achieved. Some septic tanks and cesspools can be ‘converted’ into small sewage treatment systems by installing a Mantair conversion unit. The Mantair unit is designed to fit within an existing tank structure, ‘converting’ the existing tank into small sewage treatment system. The treated effluent produced from the Mantair unit is suitable for discharge direct to a natural watercourse, or underground soakaway / drainage field. The Environment Agency recognises the Mantair unit as a sewage treatment system and authorises its use under Permit Certification, allowing the treated effluent from the system to be discharged directly into natural watercourses. Click here for further information on septic tank and cesspool conversion. For further information or advise regarding cesspit’s or cesspools, contact us on 01255 853890 or complete the form below.